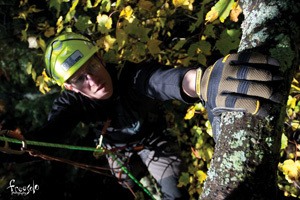 This ropework glove is built specifically for professionals who saw branches, conduct rope rescues or perform at-height structural inspections. The top of the hand is lined with Kevlar for ultimate cut-resistance protection. Memory foam padding sewn into the palms dampens shock and gives an additional layer of safety. Ropework XT gloves are available in sizes small through 2XX.